I have trouble hitting clubs especially irons from the fairway. I hit fat and thin. I can hit fairly well from a tee though. Please help! Should an average golfer ever mess with opening/closing a club face during a round of golf if they have a consistent miss? With 100% being the hardest you can swing a club, what percent should a normal golf swing be of your maximum ability to swing? Is a "full swing" like 80%, 90% or maximum effort? Or much less? What does trapping the ball mean? It always seems like when I play a safe shot to lay up I end up hitting a terrible shot. What could be causing this? How high should I tee the ball when using an iron? 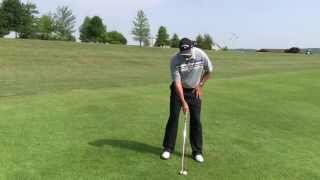 What is the impact of choking down on a club? When should you choke down on a driver or iron? What should the typical gap in distance between irons be? Sometimes I feel like I hit a 7 and 8 iron the same distance (not that big of a gap). I don't take divots with my irons, but I've heard you are supposed to. Am I at a disadvantage? Without wind, sometimes I hit my 9-iron 130 yards and other times, it goes 140. What must I work on to become more consistent with the distance of my irons? From a 9 iron to a 3 iron, is there a common distance that the ball should be moved in my stance from back to front? Should it progressively move forward, if so, by how much? How important is the backswing in my overall swing?